Build Quality (5.5/10): Despite similar appearances the all-plastic KSC35 is more fragile than the newer KSC75. The clips become loose even quicker than those of the KSC75 and the plastics aren’t molded any better despite the difference in price. As always, Koss’s excellent lifetime warranty deserves a nod here but there have been instances of the KSC35 being replaced with the ‘newer’ KSC75 model under warranty. Comfort (7.5/10): For those used to the KSC75, the tighter-fitting clips of the KSC35 may be a bit uncomfortable at first but they get better. The headphones are still very light and stay in place more securely than the KSC75s, which makes them more suitable for use while jogging or even walking. Isolation (2/10): Just like the KSC75 model, the KSC35s are open headphones. They don’t isolate and they leak quite a bit. 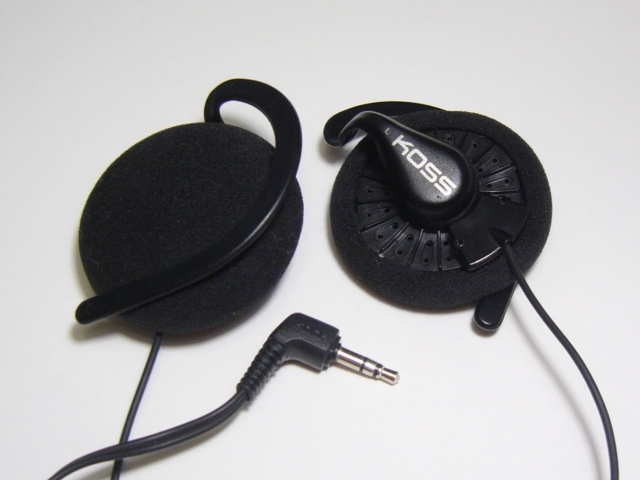 Sound (6.75/10): The drivers used by the KSC35 are said to be closely related, if not identical, to those used by the highly-acclaimed Koss PortaPro. Indeed, the comparisons between the KSC75 and PortaPro generally hold true for thee KSC35 as well – the latter clip-on is on the whole more controlled, more balanced, and more refined than its successor. Bass depth is a touch better and the bloated muddiness of the KSC75 is reduced slightly, though the low end still has a tendency to creep up. The mids are warm and balanced well with the low end though the KSC35 is definitely bottom-heavy on the whole. Clarity is excellent and detail is quite good for the price. The Sennheiser PX100-II – a long-time rival of the Koss headphones – is more forward in the midrange but the KSC35 is has no trouble portraying the energy of vocals and guitars. The treble is smooth and surprisingly refined. It is very slightly recessed and there is less treble sparkle than with the KSC75. Still, treble quantity is not really lacking and extension is equally respectable. The presentation is open and airy, akin to that of the PortaPros and PX100s. The semi-closed Yuin G2A would be the KSC35’s closest competitor as far as mid-range clip-ons go and really doesn’t offer a significant leap in presentation realism despite having a leaner and more accurate overall sound. The KSC35 has no trouble tracking multiple instruments and arguably sounds cleaner than the somewhat thick-sounding PX100 on the whole. It is also more three-dimensional and has better imaging than the cheaper KSC75. Value (7/10). (MSRP: $44.99; Street Price: $45) Originally priced at just $30, the KSC35 has been brought back into production at a new price point after being discontinued in 2005. I can’t say for sure that paying three times more for the KSC35 than the KSC75 is justified considering that the cheaper headphone has the potential to be more comfortable as well as more durable but those searching for the PortaPro signature in a clip-on will find an amazingly competent headphone in the KSC35.